AF2 is a mountant solution composed of glycerol and an antifadent and is optically transparent from 300nm into the 750nm. It was specifically designed to stop the photobleaching of the fluorescein moiety of FITC labeled biological specimens. Its application is not however limited to FITC labeled materials and has been used with advantage with many other fluorochromes including rhodamines, DAPI and GFP. It is ideal for examining tissue sections and dead cells. The AF2 mountant has been employed with the following techniques: fluorescence in situ hybridization (FISH), and confocal laser scanning microscopy (CLSM). The AF2 mountant is ideal for examining tissue sections and dead cells. An aqueous solution (75% AF2 to 25% water v/v) has a pH of ~10. The mountant solution should be pipetted onto the specimen and then a cover slip applied. If the slides are stored in a refrigerator, the viscosity of the mountant solution increases thereby helping to keep the cover slip in place. There is no need to seal the cover slip with nail varnish. Specimens mounted in AF2 have been kept in this way for many months without suffering loss of fluorescence. The solution is of medium viscosity and has a water-white in appearance. It may be stored at room temperature and ideally between 50° and 150° and out of strong sunlight. The cap of the bottle or if using the pipette supplied with the material, the cap which covers the pipette delivery point, should always be replaced after use in order to prevent the ingress of water (due to the glycerol being hygroscopic). Samples stored under these conditions for 6 months have shown no apparent deterioration. If the AF2 solution is being used in an assay, a control experiment should always be carried out. 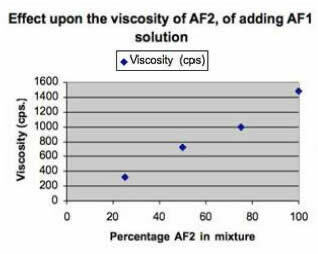 If the viscosity of the AF2 solution is too high for your purposes, it may be admixed with either AF1 or AF3 mountant solution. As the amount of AF1 or AF3 solution is increased so the viscosity decreases. Would You Like to use AF2 in a Hardening Mountant? AF2 has also been used to create a hardening formulation by adding it (~20% by volume) to an aqueous solution of poly (vinyl alcohol), e.g. Airvol 203 or Mowiol® 4-88.